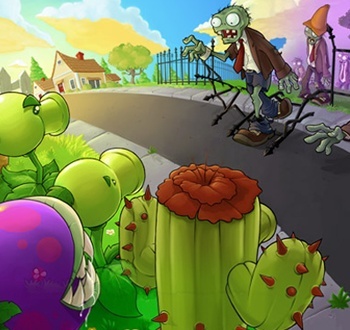 The devil of PopCap's Plants vs. Zombies is in the details of its excellent art. As a player, it's easy to isolate a single element of almost every character in Plants Vs. Zombies as the one thing that "sells it." The heart-print boxers. The Wall-nut's eyes. The pat of butter on the Cob Cannon. The sequined socks on the Thriller zombie. The dolphin. It's the presence of each of these minute, yet perfect, details which, in total, make Plants Vs. Zombies such a compelling and unique experience. "I think if you can have an amazing mechanic with stellar art, it's like Wonder Twin Powers," says Werner. He credits the game's unique art design to not only Fan's "spot-on" original concepts and the incredible work of the team at PopCap, but also to his own unique and varied influences as an artist. Check out the rest of Russ Pitts' interview with Rich Werner from PopCap in The Sunny Side of the Zombiepocalypse.